Not long after I stripped the plane of her 'Big Ole Brew' fame, our CAF wing gained a new member, Dave Fish. Dave brought to us a new revelation to the use of the B-25 Mitchell Bomber in WWII, that many were used in the South Pacific performing low-level strafing and bombing against the Japanese in the Philippines. His father, Doit Fish, was a Marine Corps pilot belonging to the squadronVMB 611, also known as"Sarles Raiders". Doit was lost on a mission, along with his crew, after being shot down in the island of DAVO. On that same mission, Col. Sarleswas also lost with his ship and crew. It wasn't until the 1950's that the remains of Doit and his crew were found, recovered, and brought back to the USA for proper burial. 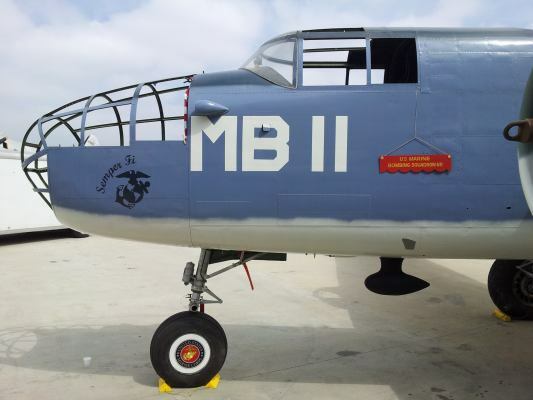 Dan Newcomb, researched the ID of our aircraft and found it was actually one of two thousand purchased by the U.S. Marine Corps in WWII and designated a PBJ-1J (Patrol Bomber, J Class).There are a handful of Mitchell Bombers still in existence that are painted to look like a PBJ, however, this plane is the only one surviving that is authentic in it's title. We decided to restore the plane and dedicate it to Sarle's Raiders, and pattern it after the plane flown by Doit Fish. 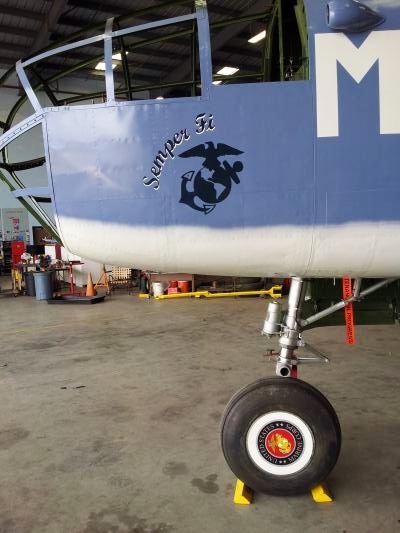 The Marine Corps, traditionally, were not allowed to place Nose Art on their aircraft, however a decision was made that we would break the rules and honor the Corps by titling the plane, "Semper Fi" (short for the Marine Corps motto:"Semper Fidelis"-- always faithful. It took me five hours to draw, place, and cut into the frisket, the Marine Corp symbol of the Globe and Anchor. Mike Hohlsmasked it off and sprayed the imron paint in less than a minute. He peeled off the mask and frisket, and viola, Semper Fi was born. Now all I have to do is add the shadowing of the letters. Last week we moved the plane out onto the ramp for a Mini Air Show, and the arrival of the only flying B-29 Superfortress, "FIFI". Semper Fi's colors showed keenly in the morning light. She's a beautiful sight. 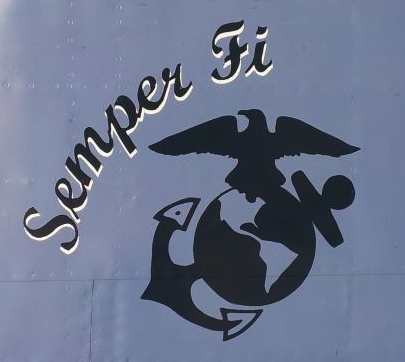 Finally made it down to the CAF last week, and finished up with the shadowing of the letters on the Nose Art on "Semper Fi". It's a relief to have it done, now I can't wait to have her fly!